Stockport MBC is not well-endowed with important buildings but English Heritage rates five buildings in Marple as worthy of Grade One or Grade Two Star status. One of the most important of these is St Martin's Church and Anthony Burton presented an eloquent description of the church, bringing out its unique attributes. In order to do this he first placed the church within the wider context of the growth and change in religious worship over the centuries. There has been a churc h in Marple since at least the sixteenth century and in Mellor probably before that. These were small daughter chapels, serving a scattered rural community and augmenting the parish churches in Stockport and Glossop respectively. After the turmoil of the changes brought about by Henry VIII and then the English Civil War a century later, various strands of differing Christian beliefs emerged and often took root in this area. 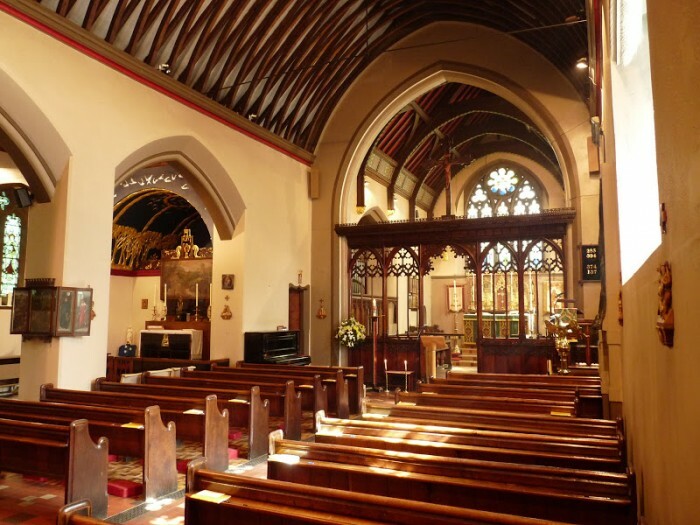 Independent chapels were established in Chinley, Wilmslow, Macclesfield and Knutsford in the later part of the seventeenth century and the Church of England saw reforming zeal with the advent of Methodism. John Wesley himself preached many times in the area including at least three occasions in the 1740s at Cobden Edge. 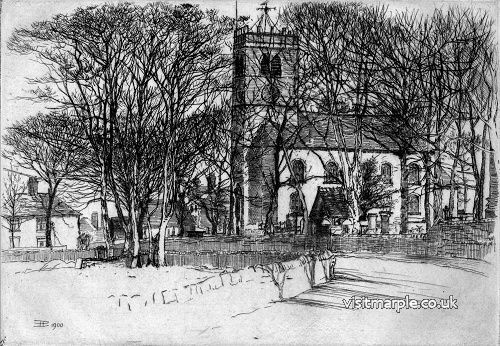 Later, restrictions on Catholicism were gradually eased and by 1859 St Mary's Catholic Church (above) was established in Marple Bridge. Whilst these movements were taking place the Church of England was going through its own period of self-examination. Although Wesley himself considered himself to be an Ang lican, after his death his followers broke away and established their own church. The Napoleonic Wars and the Industrial Revolution which was happening at the same time caused great upheavals in society but the church was not in a fit state to recognise these changes. It was still structured to serve a largely rural society and many of the clergy were out of touch with their congregations. Parliament decided to step in and finance many new churches in the new industrial cities, believing that this would give social control in a rapidly changing world. The Church Building Acts of 1818 and 1824 gave a structure to this control and many churches were built or enlarged to serve the new populations. Oldknow’s new building for All Saints (right) was built at this time but it was completely self-financed. So much for the physical developments but some of the thinkers in the church were re-examining their spiritual beliefs and developing a more ritualistic approach, closer to the Church of Rome. This crystallised into the Oxford Movement and became an influential part of the Victorian Church of England. The new owners of Brabyns Hall, Ann Hudson and her daughter Maria, were firmly of this persuasion. They wished to worship God with the splendour of Anglo-Catholic ritual in an area that could only offer what they considered the dour misery of “Lancashire Low.” When they inherited Brabyns Hall Ann gave the land and Maria put up the money for building a new church in both the theological and architectural principles of the Oxford Movement. The commission was awarded to Edmund Sedding, an ardent Anglo-Catholic who may have first met the Hudsons when they were living in Pau. He only got as far as the initial designs before his death in 1868 and his younger brother, John Dando Sedding, took over. Just at the start of his career, he became one of the leading ecclesiastical architects of the Victorian period. He created what Pevsner describes as “a quiet design” but “of uncommon sensitivity.” His important contributions included the floor tiles, the decorated ceiling, the reredos and the stained glass from the new firm of William Morris. He was brought back in in the late 1880s to design a pulpit and a chancel screen but he died in 1891 and the really important additions were made by his pupil, Henry Wilson. Wilson added an extravagant cover (left) to Sedding’s font and then created the North Aisle and Lady Chapel with its lovely apse. A few years later he introduced the St Christopher Chapel opposite the main door. He had not finished with the church as, after the Great War, he was brought back to design the bronze war memorial on the south wall. 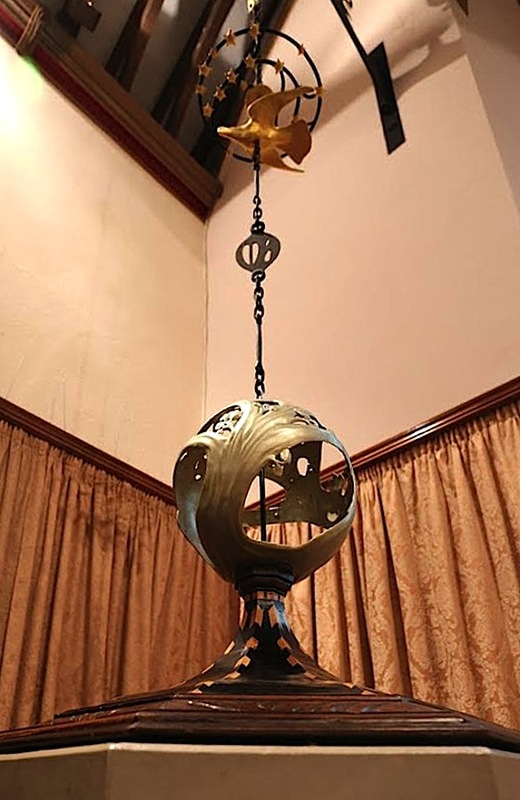 Once again according to Pevsner, Wilson has “made the church into something of more than county interest.” Anthony Burton more than complemented that verdict by showing that St Martin’s moves beyond art nouveau and anticipated art deco. A veritable jewel of Victorian art. We have an architectural gem in our community; we need to treasure it.